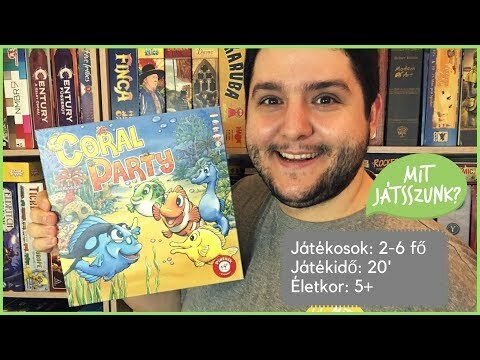 Coral Party társasjáték - Magyarország társasjáték keresője! A társasjáték érték! In Tief im Riff ("Deep in the Reef"), players work cooperatively as fish swimming through a coral reef to turn over 28 sea animal tiles placed around the game board. The fish start in one location, then travel through a series of paths — following the arrows as they move — to reach openings in the reef. On a player's turn, they roll a die, then choose one of the four fish and move it along paths a number of spaces equal to the number rolled. After they finish moving, if they're on a space all by themselves, they can reveal a tile that has only one bubble on it. If they share a space with other fish, they can reveal a tile with as many bubbles as the number of fish on that space. Thus, players need to keep their school from wandering too far apart as they travel through the reef. If the players manage to reveal all 28 tiles before all four fish have swum out of the reef, then they win! Coral Party Játékbemutató - Mit Játsszunk?